If you would like to know how to knit a blanket, or think that it may take too long to do, think again. 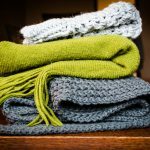 Knitting a blanket for beginners couldn’t be simpler, and here is how you can get started. If it is the first time you are knitting a blanket, then it is best to knit squares that you can join together at a later stage. In this way, you can make the blanket as big or small as you like. It is also easy to knit squares, and you can do this at night while you are watching television. That way you will feel that you are achieving something while you are sitting in essence and doing nothing useful anyway. 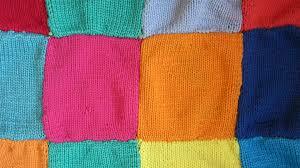 If you want to make a baby blanket, a good size to knit would be 10cm x 10cm squares. For bigger blankets, I would recommend knitting squares that are at least 20 cm by 20 cm. 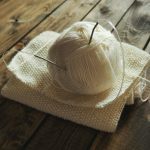 You would need to first make a gauge swatch with the wool and needles of your choice so you can work out how many stitches you would need to cast on to get your desired measurements. The easiest way of knitting squares if you don’t want to make a gauge swatch is to start by casting on one stitch, then each row thereafter you cast on a stitch at the end of the row. Once the edge of the work is the desired length, then you start to cast off a stitch at the end of each row that you knit until you have one stitch left on your needle, which you can just cast off. It will feel almost like you are knitting a diamond or a triangle. 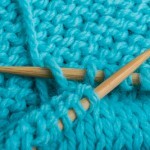 If you are totally new to knitting, you may want to read the article How To Knit For Beginners. To knit a square with 3.5mm needles, a rough estimate would be to cast on 44 stitches and knit until your work is 20 cm’s long before casting off. The great thing about knitting squares is that you can make different colours, and even different patterns to join together for a more interesting throw. You could even try mixing knitting and crochet. Some squares can be knitted and other crocheted for interesting variety. Previous Post How Is Wool Made?